Ripe with lessons drawn from historical and contemporary struggles for workers’ control, Ours to Master and to Own is essential reading for those struggling to bring to birth a new world from the ashes of the old. 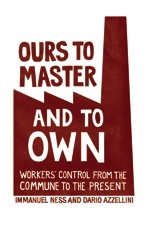 Ours to Master and to Own is the most substantive and comprehensive work on workers control and self management today. I strongly recommend this work, which provides examples drawn from throughout the world of workers struggling for justice and power. The seemingly logical and just idea that workers themselves should make the decisions regarding and reap the benefits of their labor has always been a fraught concept with the potential to topple or reform whole societies … This ambitious, copiously researched and clearly written text provides a sweeping diversity of examples, analyzed with cool detachment from the specific politics but with underlying passion for the larger concept. With the global capitalist order entering a period of crisis, but also with the dramatic increase in worker’s struggles especially in the global South, this collection is extremely opportune. Workers will seek greater control over market forces and workers councils are bound to re-emerge. A must read for labour analysts and activists alike. Ness and Azzellini have made a major contribution in producing this insightful and exciting collection of essays on the question of workers control … I didn’t even have to open the book to know it is timely and offers great strategic insight. —Bill Fletcher, Jr., Visiting Scholar, Center for Place, Culture & Politics, CUNY; editorial board, BlackCommentator.com; co-founder, Center for Labor Renewal; immediate past president, TransAfrica Forum; co-author, Solidarity Divided. Excellent! A very complete, serious and inspiring account of the movements for workers control and their difficulties. There is no doubt that it should become a standard point of reference for future discussions, and actions.